A small region of about 7500 sq. 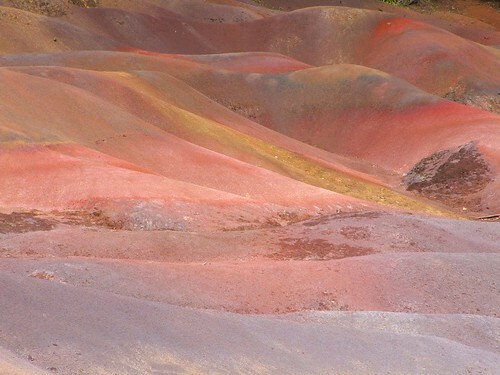 metres near the village of Chamarel, Mauritius has a geological oddity of earth of seven colours - red, brown, violet, green, blue, purple and yellow. Reportedly this is the only location in the World where one can see earth of 7 different colours at one place. The coloured earth also has a strange property of settling into its individual colour group even if it is mixed with other colours. When earth of different colours is mixed, a few hours later, the sandy particles re-group and settle into layers of individual colours. (Source: French Wikipedia - English Translation). Several web pages also mention it. However, I couldn't find any scientific explanation for this strange phenomenon. Located amidst a large dense forest, the colourful earth against the backdrop of green trees is a major tourist attraction of Mauritius. In order to preserve the dunes and protect it from tourist influence, the site, which is privately owned, has been barricaded and tourists are allowed to view it from a platform constructed at the area. Mauritius' highest waterfall with a sheer vertical drop of about 100 metres, is also located in close vicinity of the coloured-earth. 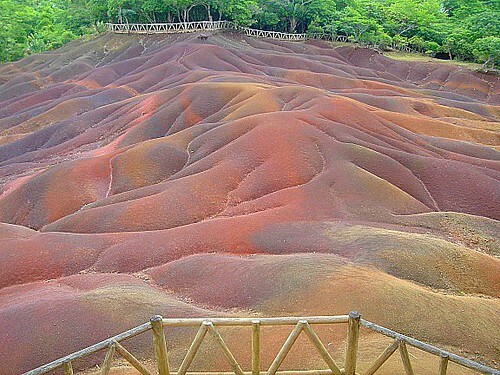 Detailed info: Scientific paper entitled - The "seven-coloured earth" of Chamarel, Mauritius (pdf format) published in 'Journal of African Earth Sciences'. 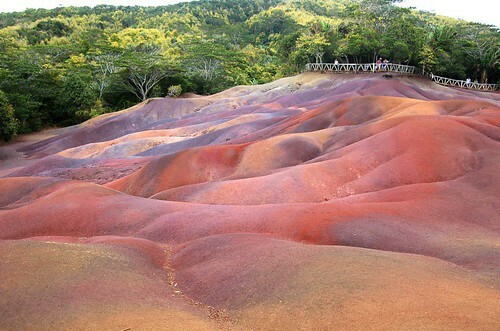 this is awesome and further fuels my desire to visit this beautiful land know as Mauritius! 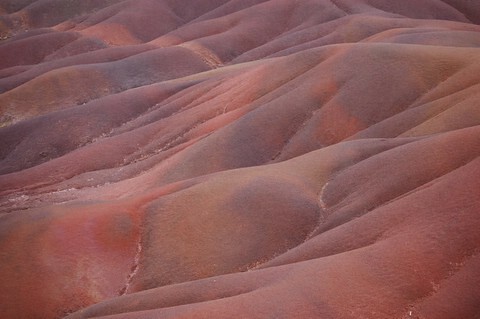 When I was a child we often went to the coloured earth of Chamarel and with my kid's eyes the place seemed huge!!! We went back some years later with some friends and I realized that it wasn't actually as big as I had memorized it! It was still a very nice visit though!